This post is designed to help you remember the sorts of questions you should be asking when taking a history of headache in a child. Harry gets lots of headaches. In the morning, his headache wakes him up and he vomits all over the bed. This makes his mother very angry and she smacks him over the head. He doesn’t notice the warning signs that she’s coming, because he has a very stiff neck. He tries to get out of bed, but his legs have gone all tingly. So he crawls towards the bathroom, but he can’t really find it because his vision has gone all blurry, and the bright bedroom light hurts his eyes. He goes downstairs to have his breakfast, but it hurts when he chews, and he starts coughing and spluttering because his nose is blocked. Finally he says he wants to take the day off school because he has a fever his tummy hurts, but when he goes to lie down, the headache just gets worse! How bad is it 1-10? Do you have any ‘warning’ signs that it’s about to happen? Does it affect your vision at all? Do you have any other sensory/movement changes? Have you noticed if it occurs at a particular time of day? Have you noticed anything that sets it off? Medications – are you on any medications? Is it worse when you lie down? Have you been suffering from any neck stiffness? Have you had any photophobia? Have you had any morning vomiting? Has it woken you from sleep? Have you had any problems with nasal congestion? Is it worse when you chew? Have you had your vision checked recently? Have you had any head trauma recently? Have you had any changes in consciousness? As a doctor you have to try and give useful answers to fairly important questions, like, better than this. Differential diagnoses are one of the most useful tools when it comes to diagnosing symptoms and it’s important to ensure you’ve thought of as many of the potential causes as possible. Here’s a weird way to remember the key causes of a headache in an emergency situation. You are on duty in the emergency department and you’re feeling incredibly tense, as someone has just fired off a cluster grenade somewhere in the hospital. You’ve just been called in to see a patient who has a very bad headache, who says he has a history of migraines. As you enter the room, you notice he’s holding a cricket bat and smoking a huge joint. 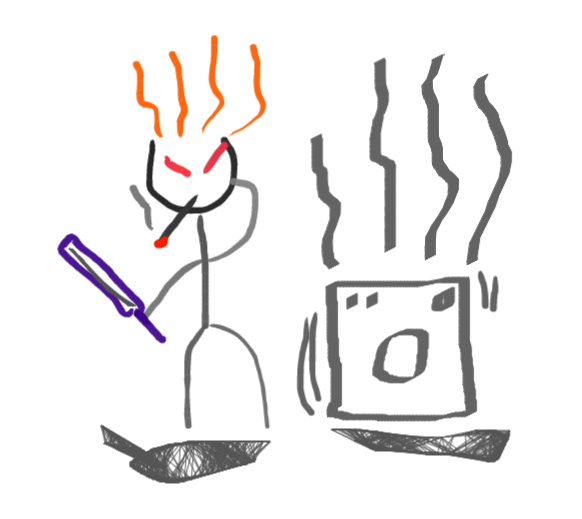 Next to him a washing machine is spinning out of control, pouring smoke all over the room. You notice a weird tingling stiffness in your neck, when suddenly his head catches fire. The man stands up and says “To Be Honest mate I’m just gonna go home”, but his head begins to expand and he starts grinding his jaw. You don’t see what happens next because you go blind and pass out. – Any loss of consciousness? – Any decrease in consciousness? – Any fitting/biting of tongue? – Any other medical conditions? – Any changes in vision? – Sudden or gradual onset?